Attorney Nate Boulton is a partner with Hedberg & Boulton, P.C. Nate practiced for two years as an associate attorney before being named a partner with the firm in 2007. 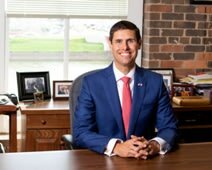 He earned his law degree with Honors, as well as a Certificate of Legislative Practice, from Drake Law School in May of 2005 and was admitted to the Iowa bar that year. He also has a Master of Public Administration degree from Drake University and a Bachelor of Arts degree with Honors in history and political science from Simpson College. He is a 1998 graduate of Columbus Community High School in Columbus Junction, Iowa. Nate Boulton practices in workers compensation, personal injury, and labor law. He is a former vice president of the Iowa Association for Justice (formerly the Iowa Trial Lawyers Association). Nate also previously served as president of the Iowa Workers' Compensation Advisory Committee. He also regularly serves as a grader for the Iowa Bar Examination. Aside from his law practice, Nate is an adjunct professor at Simpson College, where he teaches courses related to law and leadership. As a past instructor at William Penn University, Nate received the 2011 Faculty Achievement Award and served as Chair of the Faculty Advisory Committee from 2010-2012. In addition to his undergraduate teaching responsibilities, Nate has also served as an adjunct professor of labor law at Drake Law School. Nate was elected to the Iowa Senate in 2016 to serve a four-year term from January 2017 through January 2021.